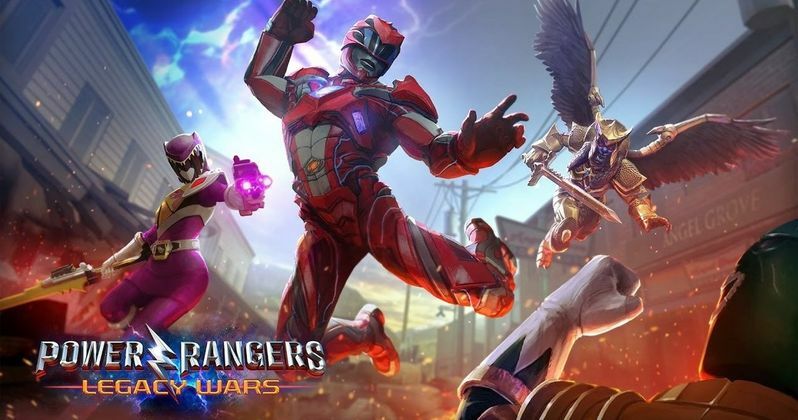 Cutting-edge game developer nWay, in partnership with Lionsgate, a premier next generation global content leader, and Saban Brands, creators of the iconic Power Rangers franchise, today revealed the first screenshot and game details for Power Rangers: Legacy Wars. The game is a real-time multiplayer PvP fighting game set to be released in March 2017 for iOS and Android devices. The studio has released a first-look video, which you can check out below, along with the first image. Power Rangers: Legacy Wars marks the first video game to feature Power Rangers from Lionsgate's highly anticipated feature film releasing March 24, 2017. Also featured in the game are iconic, past and present Rangers and villains from the Power Rangers television franchise, one of the longest running kids action series in television history currently in its 24th season. Here's what Taehoon Kim, CEO, nWay, had to say in a statement. "Power Rangers: Legacy Wars will be a game of many firsts for the expansive Power Rangers universe. In collaboration with Saban Brands and Lionsgate, and with our vast experience in matchmaking player vs player games over networks, we have created the first synchronous multiplayer fighting game allowing Power Rangers fans all over the world to battle against each other in real-time." In Power Rangers: Legacy Wars, Rita Repulsa, evil space witch, will step into and corrupt the Morphin Grid. As she manipulates reality in an effort to implode the Grid from within, Rita will create virtual monsters and Ranger clones programmed to fight on behalf of evil marking the first time players will experience Power Ranger against Power Ranger game play. To beat Rita at her own game, Zordon will give players special powers and the ability to curate their own team of legendary Power Rangers and villains from the multiverse. Here's what Peter Levin, President, Interactive Ventures & Games for Lionsgate, had to say in his statement. "Our mission is to create unique and immersive gaming experiences for the fans of Lionsgate's content allowing them to become more involved with their favorite characters and nWay has developed a technology that does just that. The Power Rangers brand has always been about being a superhero with your friends and we worked with Saban Brands to bring that philosophy into a Power Rangers game for the first time by applying a multi-player mechanic with a mashup of characters that spans decades of Power Rangers storytelling." Saban's Power Rangers franchise is the brainchild of Haim Saban, creator and producer of the original Mighty Morphin Power Rangers hit series that launched in 1993. Following its introduction, Power Rangers quickly became the most-watched children's television program in the United States and remains one of the top-rated and longest running kids live-action series in television history. The series follows the adventures of a group of ordinary teens who morph into superheroes and save the world from evil. It is seen in more than 150 markets, translated into numerous languages and a favorite on many key international children's programming blocks around the world. Here's what Janet Hsu, CEO, Saban Brands, had to say in her statement. "Power Rangers: Legacy Wars will be an interactive game providing the Power Rangers' global fan base with an experience unlike any they have seen from the franchise. With nWay, we are combining the best of the Power Rangers' 23-year legacy with the reimagined Power Rangers from Lionsgate's upcoming feature film with Saban Brands. For more information about Power Rangers: Legacy Wars, and to sign up to be the first to know about new updates, availability and more, please visit PlayLegacyWars.com. Power Rangers stars Power Rangers stars Becky G (Yellow Ranger), Naomi Scott (Pink Ranger), RJ Cyler (Blue Ranger), Dacre Montgomery (Red Ranger) and Ludi Lin (Black Ranger), with Elizabeth Banks also starring as the villainous Rita Repulsa, Bill Hader voicing Alpha 5 and Bryan Cranston portraying Zordon in this remake. Take a look at this new Power Rangers: Legacy Wars game trailer and the new image.